When you board a cruise, you've got to make a couple of statements about your health, on one of those forms pretty much everyone ignores. One: You can't be knowingly, contagiously sick -- guts blowing up, coughing up cruds, that sort of thing. Two: You can't be so far into a pregnancy that you might just, like, give birth on board. Nice part about the start of life, actually -- within a reasonable timeframe, we all pretty much know when we're going to be born. Fast forward a few decades, perhaps, and that hour of death is anyone’s guess, a dark game of musical chairs. And for the dozens, possibly hundreds of people who die each year while aboard a cruise, those chairs are probably weatherproof and fold out flat as a board. Cruise lines aren't exactly jazzed to talk about how many people die while at sea, but it's enough that they've got to have some protocols in place for the inevitable. Popular rumors among former employees and interested cruisers, meanwhile, tilt positively lurid. Time to parse through the fact and fiction of what happens when someone dies on a cruise. A persistent urban legend among people who work on cruise ships holds that ice cream is a secret tell for a dead passenger. The idea being that if extra and generous servings of the always-a-good-idea dessert were being doled out, it was because the chefs needed to clear out a freezer chest to store a body. Keeping corpses in the cooler isn’t, as you would expect, the official protocol. Contemporary cruises, the largest of which is Royal Caribbean's Harmony of the Seas, can carry nearly 5,500 passengers and are required to maintain a morgue (quite separate from the kitchen’s freezer area) that typically has enough room for six to 10 bodies, along with a stock of body bags. "Cruise ships are prepared to address the unexpected passing of a guest or crew member," Michael J. McGarry, CLIA’s senior VP of government and public affairs, wrote to me in an email. "While requirements will vary, cruise lines prepare for these situations and comply with the applicable requirements, including protecting the health of crew and passengers." Which is another way of saying that ice cream freezers likely rarely cameo as chilling units for bodies. The average age of a cruiser on a five-to-seven-day voyage is 50 -- a robust age. On multi-month cruises, though, the average age shoots up to 75 -- that’s the average, mind you. It follows then that not everyone is going to survive a longer trip at sea. Which, when you think about it, is actually a great way to go out. Cruises are subject to strict regulations, which most passengers experience as a bombardment of intercom announcements. Two such announcements -- which the Cruise Lines International Association (CLIA) would not specifically acknowledge happen -- are more ominous than your run-of-the-mill heads-up on disembarkation times. 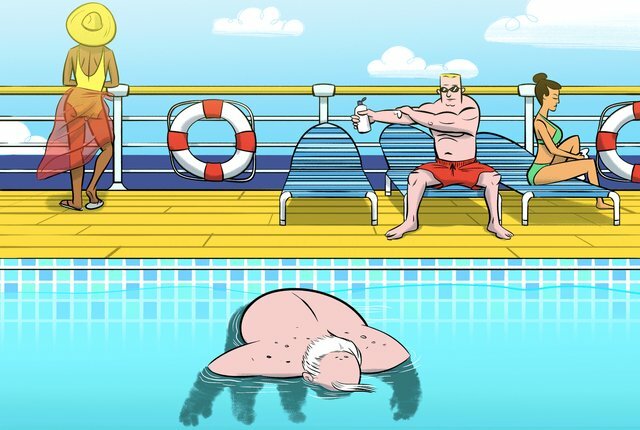 So, how often do people die aboard a cruise? Cruise lines don’t exactly trumpet the exact number of deaths per year, but as per the Centers for Disease Control and Prevention (the good ol' CDC), a ship must divulge "any deaths or certain illnesses" to its port state. A look at such records from 2008 to 2018 from the Brevard (Florida) County Medical Examiner’s Office, home to Port Canaveral, the country's second-busiest, counted 129 naturally occurring deaths on cruises, including seven so far in 2018. Similar data from Miami-Dade County authorities reported 206 natural and 29 accidental deaths aboard cruise ships that call at America’s busiest port in the same period. So for the nearly 10 million annual passengers who sail out of Florida, America’s flagship state for multi-day cruise embarkations, the incidence of death aboard any given voyage is low. Overall, the number that keeps popping up (as in Gizmodo and The Telegraph) is in the neighborhood of 200 dead cruisers a year, which, you know, for an industry that puts more than 20 million mostly greying individuals on the open ocean every year ain’t bad. The odds are overwhelmingly in your favor of returning home alive. For those who do wind up in the bag, the cruise’s first order of business, typically, is to get ‘em off the boat as soon as is reasonable, ideally at the next port. There, the bodies of deceased passengers are unloaded, provided that the port country is able (has a morgue) to and willing (friendly) to accept the body. Whichever port country accepts the deceased can then issue a death certificate, the next step toward repatriation. For those passengers whose death did not occur abroad, a death certificate is still required for a legal ruling on the cause of death. Without that, the next of kin may encounter complications with the deceased’s will. The CDC will hand the cruise to do a pile of paperwork after these deaths, and the headaches may not stop there for cruises. Dead people's families may sue. What I found talking to maritime lawyers and others around the industry is that it's simply not as regulated as air travel. There is no FAA equivalent for boats. Most cruises retain a care team who will help the next of kin with repatriation: contacting a funeral home, making travel arrangements, dealing with insurance, and working with the local authorities back home. Some cruises also offer religious support. One seagoing group, Apostleship of the Sea, provides Catholic maritime ministers and priests to cruise lines; they offer religious consultation for mourners along with their typical chaplain duties. Then there’s the matter of getting the body home, if that’s even what the family elects to do. Neither the consulate nor the cruise line will cover the costs of transporting the person’s remains; travelers insurance will usually cover much of the expense, which can be considerable. The dead, notoriously bad at bargaining, travel at higher prices than the living. A body can also rest in the on-ship morgues for around three days, allowing the ship to stay on course until an accommodating port is reached. Family or friends of the deceased are welcome to leave at an earlier harbor. Or, as was the case of Bob Schaefer, whose mother, Marion, passed early on into a 114-day cruise in 2009, they can stay and finish the voyage solo. “I know she would want me to go on,” Schaefer said at the time. After dealing with the necessary paperwork, he arranged for his mother’s cremation at the next port and journeyed with her cremated remains for the duration of a world-spanning trip. No reason you should let the end of one life well-lived curtail the trip of someone else’s lifetime. Frankie Caracciolo is a contributing writer at Thrillist.